I’ve always been a bit unclear on those words that sound the same, but are spelled differently and have different meanings. Are they homonyms? Something like that, I forget. But what I’m 100% certain about is the camel. You know, the dessert wonderer. The animal who dreams of sweet deliciousness. Cake, pie, cookies, and perhaps even pudding. We’re guessing camels are wondering about desserts while wandering across the desert. It’s so dry and endless – I’d think about cookies too. For a period of 10 years Happy Bungalow will repair, replace, or refund materials (exclusive of shipping) that prove defective, upon inspection (or emailed photo) by us, during normal residential use. Scratches, dings, and dents that may occur through typical use. Damages caused by abuse such as, but not limited to, smashing, kicking, throwing, hammering, tantrumming, Evel Knievel stunt reenactments, attempted sub-orbital space flights, etc. etc. This is an indoor product – left outdoors for a period of years it will do what natural wood naturally does and turn into dirt. 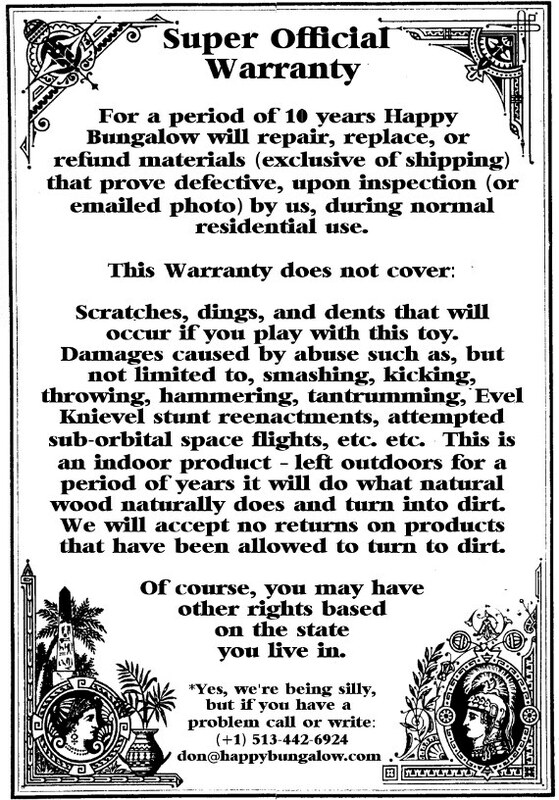 We will accept no returns on products that have been allowed to turn to dirt. Of course, you may have other rights based on the state you live in. 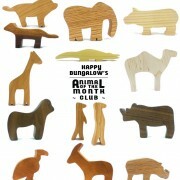 Welcome to Happy Bungalow’s Safari Animal Toy of the Month Club! 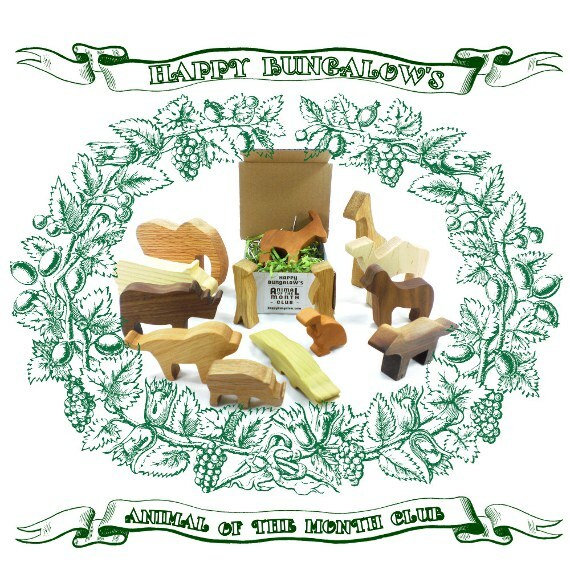 For TWELVE consecutive months you (or anyone you designate) will receive, a new natural wood animal toy(s). Each month on your doorstep will arrive a box filled with a fun toy (and a few extra goodies). In addition you can print accessories from our website. 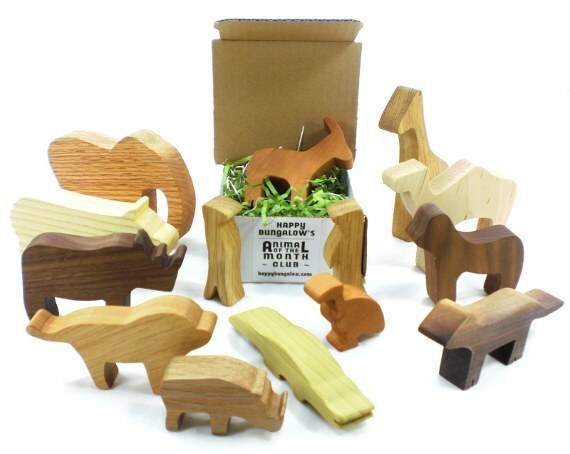 All our animals are made from natural woods: ash, cherry, hickory, maple, oak, poplar, red oak, and walnut. The colors are natural, we use no stains or dies. 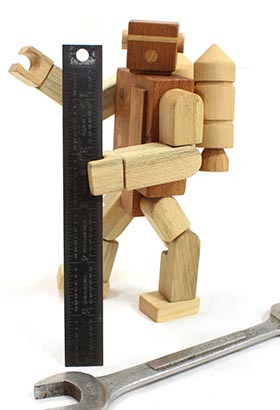 Being a natural product, the color and grain orientation of each toy will vary slightly. All of our toys are hand-sanded smooth and finished with a beeswax and linseed oil polish we make ourselves (our kids love to help with this). Everything is non-toxic and safe. Purchase your subscription from our online toy shop today! Okay, who doesn’t love to look at the pretty peacock? And elephants, bears, and horses will always rank high on our favorite animals list. Alas, the world is a diverse place with diverse needs. The vulture may not be the loveliest or the most loved, but it is very important. 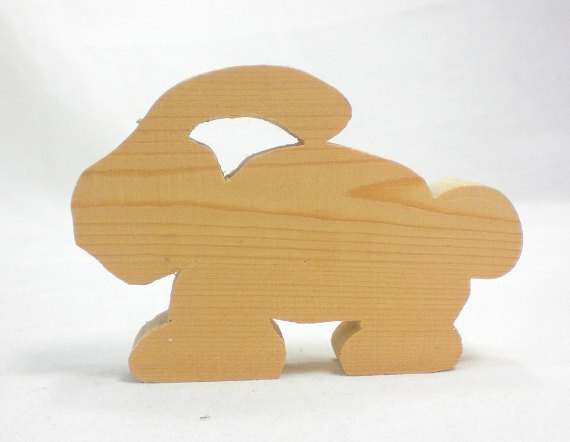 Though we will say that this wooden vulture toy is pretty darn cute and will turn a head perched in your playroom or lounging on your desk. 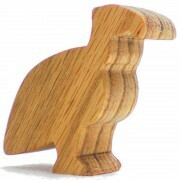 Pick up your own wood vulture toy from our online toy shop today! We just love giraffes here at the Bungalow. At our local zoo you can feed the giraffes a little giraffe cracker. Right out of the palm of your hand! How cool is that? 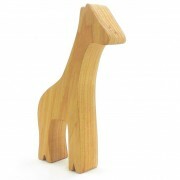 Happy Bungalow’s giraffe is crafted from hickory, sanded smooth, and finished with a beeswax polish we make ourselves. 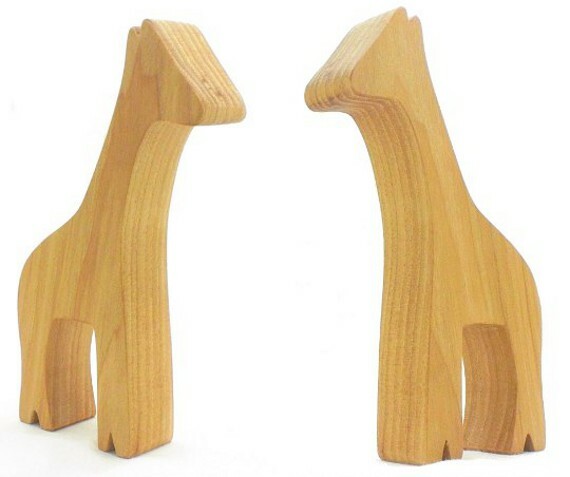 Pick up your own giraffe toy from our online toy shop. Q: Wait, where’s the warthog? I only see is a rhino. A: Well, you know, rendered in wood, warthogs and rhinos look strikingly similar. We create all our animal patterns from scratch, tweaking real-life animal profiles to conform to the realities of wood toys. 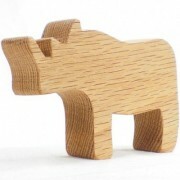 So you can call it a warthog or a baby rhino (as paired with our purpose-crafted rhino toy). 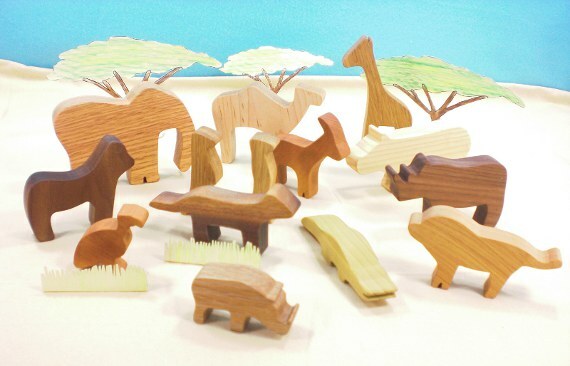 We call this little wooden animal fun. 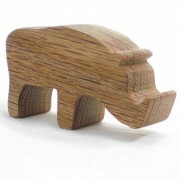 Take home your own wood animal toy warthog from our online toy shop today! 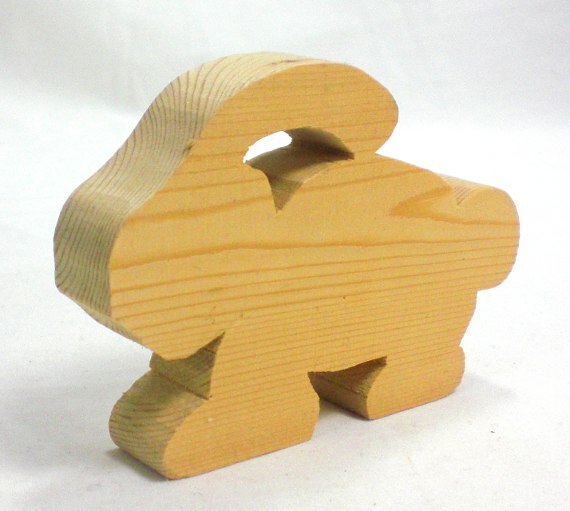 Looking for a wooden toy rhino? Pick it up here. Most animals are better admired from the far. The rhinoceros, weighing “a million pounds” and armed with “giant sword horns” is certainly an animal better admired from afar. Even without the exaggerated quotes from small children. This rhino toy was one of Happy Bugnalow’s first animal toys and still one of our most popular. We craft our rhino from red oak, carefully sand all corners smooth, and finish it off with a beeswax polish we make ourselves. As with all our toys, it’s made to be passed along to another generation. 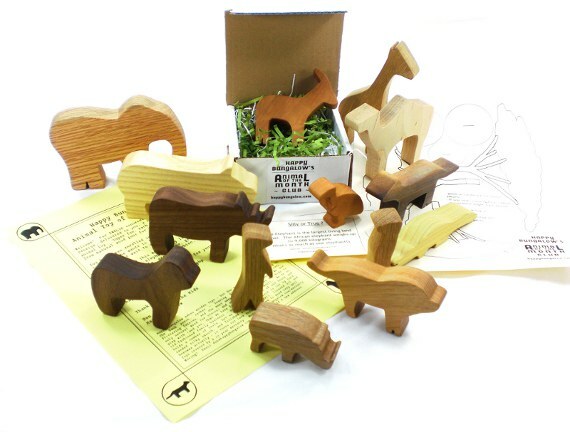 Take home your own wooden toy rhino from our online toy shop today! 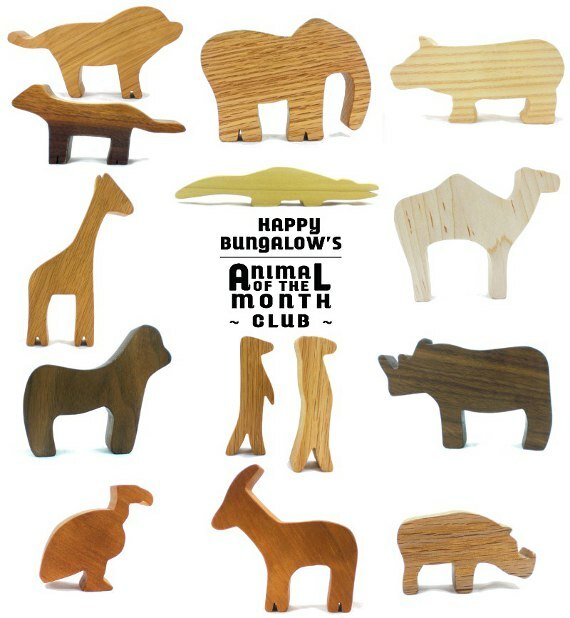 Today we throw it back to just about the first Happy Bugnalow toy ever prototyped. I think it was just about the first thing I ever made on a scroll saw. This was made when Happy Bungalow was just starting up. We were ordering a few pieces of new professional grade equipment, but still trying to make it by on the thinnest shoe-string budgets. So this little animal was cut on a piece of pine that was hanging around the shop. I drew from (cartoonish) memory the shape of the animal. I was happy that others recognized the shape was a bunny, but disappointed in how lame the thing looked. So I set about drawing animal profiles from real animals (usually from pictures, but occasionally from real life as in our bison toy). When we fist started there were two primary animal lines: farm and safari. 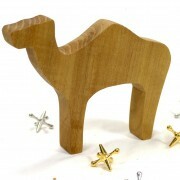 Since we’ve added to our shop woodlands animals, dinosaurs, and mythical animals (think unicorns). In addition we’re working on adding water animals, Australian animals, and just about every other animal that can be rendered in wood. 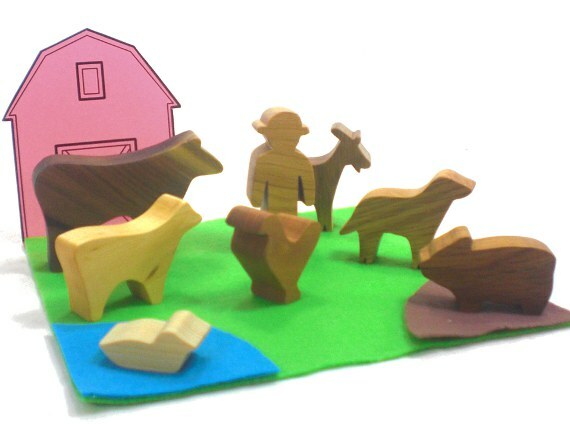 Reproducing real life animals into small wooden form took some tweaking. Legs were too thin, bellies to bulgy, and the like. Legs are the biggest problem. Like, have you ever seen how thin a horse’s legs are? Or a chicken’s? In the beginning there was a lot of tweaking and fussing to get the animals just right, but now, I think we’ve made close to one hundred different animals so far, we usually nail it down pretty quick. So kids, remember – what they say is true. Practice Makes Perfect! Or just a lot better. We’ve been collecting vintage images and illustrations for a while now. There are a ton of cool old pictures out there. Some are a bit disturbing, others speak to deep-rooted fears. Like lions. I was at the zoo with the Kids last year and for the first time heard an honest to goodness lion roar. We weren’t even at the lion exhibit. We were over looking that rhino or the ice cream cones or something. 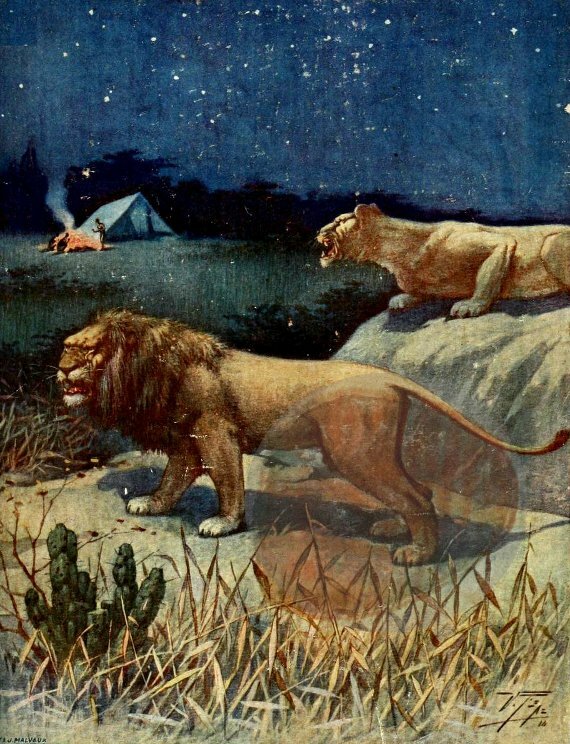 But man was that lion load. So yes, this vintage illustration from a French book will probably give me a nightmare tonight. 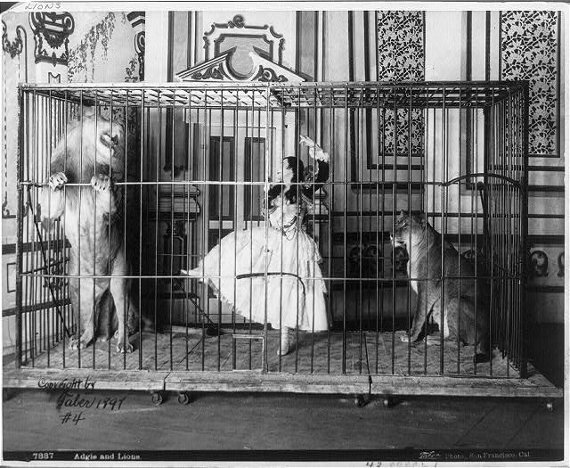 We found this image with some assorted circus images – you know – weird clowns, high-wire acts over pits of fire, and this – stuff that makes sword swallowing look tame. It’s bad enough to not have a fence between you and the lion, but to have a fence trapping you? Eek! But fear not! 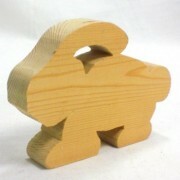 Happy Bungalow makes a lovable, touchable, almost cuddly wooden lion toy. Head over to our online toy shop and pick up your own lion.